My interest in linguistics and programming is continued with an experiment in morphology and srmorph project. It is a pilot endeavour I use to test ideas about parsing words of my native language (Serbian) on word level, and later, syntactic level. This post is about the work in progress. What Can Be Seen, Searched, Parsed? Listing all Serbian prefixes, suffixes and infixes in database (hopefully, it will contain all Serbian affixes). Morphological word analyser that should return postulated or assumed morphology of a word (ie. word = preffix + root + infix + suffix). Similar words searcher in Serbian which for given words returns similar words based on similarity percentage, where similarity is calculated by number of the same letters in the same position. 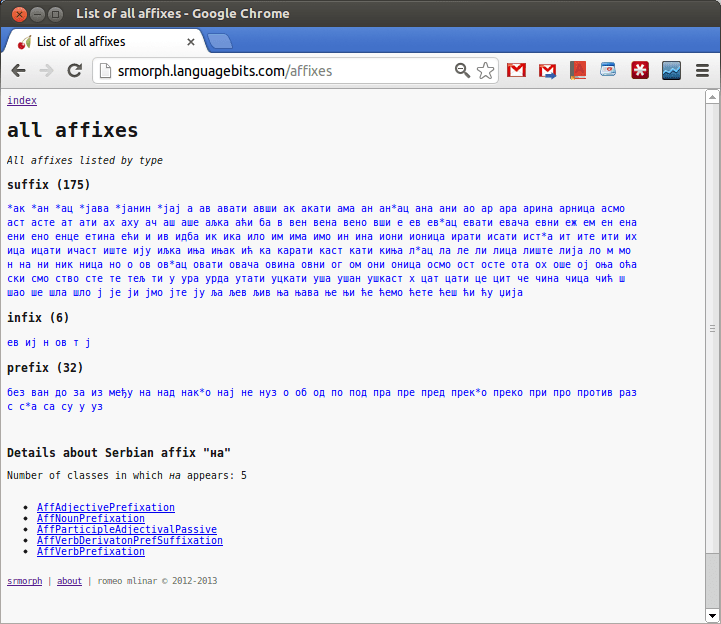 Affix classes (data) filtered by grammatical processes. At the foundation of srmorph are Serbian affixes. I always wanted to write a parser that would work by first examining words on the level of prefixes an suffixes (infixes are somewhat tougher problem). Therefore, the analysis is for now based on identifying affixes. """Suffix. Example: 'доктор'. Ref. Klajn:51.""" The attribute suffix lists seven endings glued to some masculine nouns in Serbian (Croatian, Bosnian). POS identifies word class, here a noun, etc. The inherited Serbian affix classes (60+) are so far parsed functionally. I have set up a dynamic website at http://srmorph.languagebits.com/ which shows some of the things that can be done by parsing. For now the algorithm is rather straightforward, until further filtering is introduced on word class level. Once reasonably developed, the project will become open source.